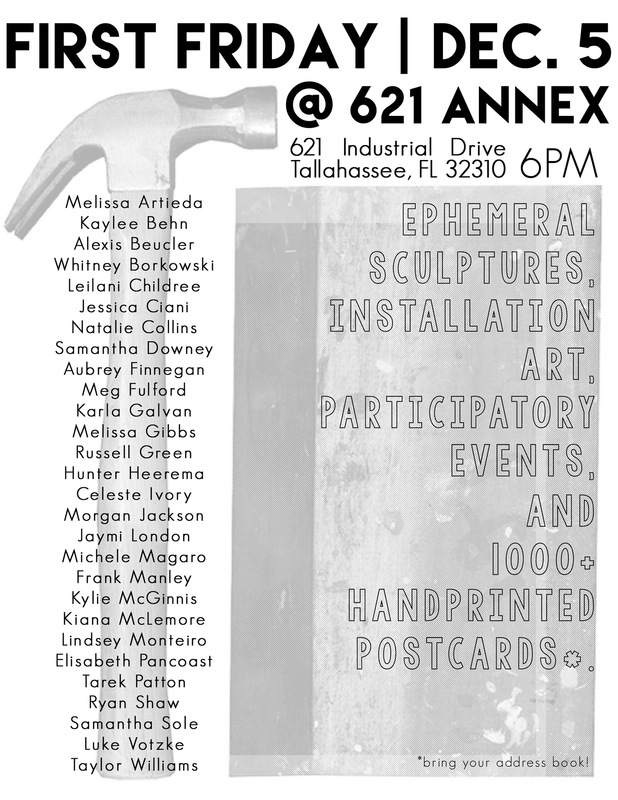 The 621 Annex in Tallahassee’s Railroad Square Art Park presents an interdisciplinary exhibition of fine art sculptures, participatory events, and over one thousand handprinted postcards. 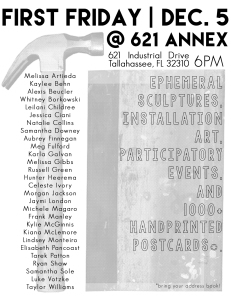 Haley Lauw’s Screen Printing Media Workshop, as well as Allison Milham’s Screen Printing Media Workshop, has created an accumulation of over one thousand handprinted postcards. Four students from Michael Diaz’s Sculpture Class, through a series of meetings and brainstorming sessions, have created a collaborative project utilizing postcards as a sculptural medium. And, Nick Parparian’s Sculpture II class has created a number of sculptural works exploring the theme of ephemerality.